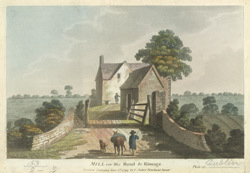 View of a mill on the road to Kimage, near Dublin in Ireland. Dublin and the surrounding areas were expanding rapidly in the 18th century and with the development of corn and woollen mills along the rivers, Dublin became an important commercial and manufacturing centre. Kimmage is located on the south side of Dublin city.